Like I said before, you never know who you might meet on Triton’s campus. On my way to interview another one of our faculty members here at the college, I ended up interviewing another faculty member. In the cafeteria I watched as students came to pick up books passed out by, Ms. Renee Wright and Ms. Margaret (Peggy) Murninghan. These two dedicated ladies worked to get our students these free reading materials. It is funny how things just work out, being at the right place at the right time. 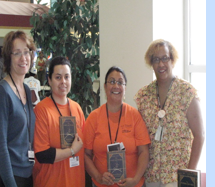 Renee Wright and Margaret (Peggy) Murninghan with students, at the Fourth Annual ONE BOOK ONE TRITON free book passing. 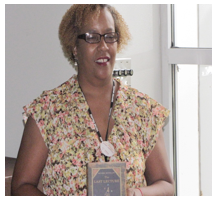 By Lushan Baker Renee Wright received a Bachelor of Arts Degree in Psychology from Dominican University and a Master of Science in Education Degree in Literacy from Dominican University. 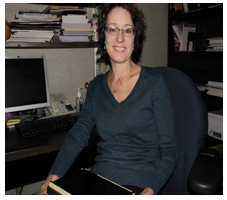 She is in the final stages of completing her PhD in Adult Education & Curriculum/Instruction from Capella University. Ms. Wright is currently overseeing the Triton College Learning Communities and spearheads our very successful annual One Book One Triton community wide read program. In May of 2009, she happily received the National Institute for Staff & Organizational Development Excellence Award. In spring 2010, she was nominated for and awarded the Triton College Employee of the Semester. Wright also received a nomination for the Triton College Outstanding Faculty of the Year Award. Wright has been very active in the Triton College community. She established a tutoring program that was approved by the state as a Supplemental Service Provider. She also held the position of past president of the Northlake Children’s Learning Center, in the village of Northlake. Renee says she has a passion for teaching and the success of her students. Peggy is known to say “everything is a business” so if you are going to be a nurse, a writer, or an artist you can benefit from taking a business course. We all need to understand how organizations work. Her classes usually begin with music to greet the students and get everyone in the right frame of mind to learn and share. Current topics in business are always talked about how to reinforce course concepts. So next spring when you are thinking about taking a class look up instructor Murnighan and register for one of her classes – you won’t be disappointed. Murnighan is also active on campus outside the classroom. She is a member of the One Book One Triton committee, the HR Functional committee, and she chairs the Professional Development committee. She has developed a number of new online courses including Introduction to Human Resource Management BUS 200 and Compensation and Benefits BUS240. In an effort to learn more and contribute more to the Triton community, Murnighan is enrolled in a doctoral program that focuses on community college leadership. Now I like the way this lady works. Just from interviewing her, I want to take one of her classes. They sound like fun, especially the music part.